Smart clothing seems to be just around the corner, with several companies already selling specialty items (athletic wear, baby clothes, etc) embedded with sensors. However, quantitative forecasts describing the prevalence of smart clothing in the next 10 years or so are hard to find. Gartner made a forecast to 2016 back in 2014. Tractica has a forecast to 2020. Both forecasts describe millions of units shipped worldwide. Although it’s difficult to extrapolate market penetration, both reports suggest that smart clothing will be more prevalent than wearable devices. Other research firms and analysts are skeptical of such a swift uptake by smart garments, instead forecasting dominance by other wearable devices. 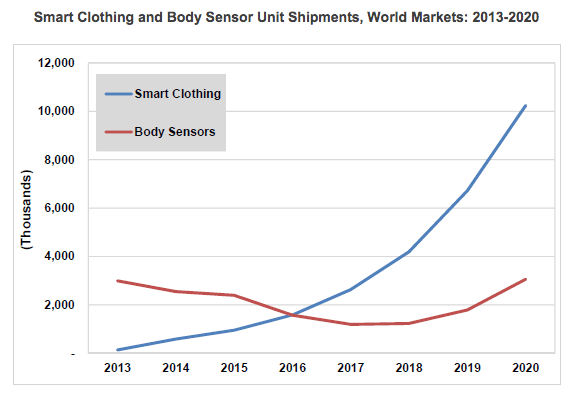 Tractica forecasts that smart clothing shipments will grow from 140,000 units in 2013 to 10.2 million units by 2020, while body sensor shipments will decrease from 3.0 million units in 2013 to 1.2 million by 2017, before rising again to 3.1 million units in 2020. Note: Angela McIntyre, Gartner research director – gave an interview to The Guardian. Might be available for comment. James Stables. November 18, 2015. “Juniper Report Skeptical on Smart Clothing but Says Fitness Trackers are Set to Soar.” Wearable.com. Note: The White paper seems to be referring to this paid research report. The US market for wearables is forecast to evolve more quickly than worldwide, leading to a peak of 68.3 million units in 2019, then dropping to 62.9 million in 2020. Smart watches will be the top category as of this year in the US, followed by smart bands/bracelets. In 2020, headworn wearables are expected to become the number two segment. Bob O’Donnell. May 2015. 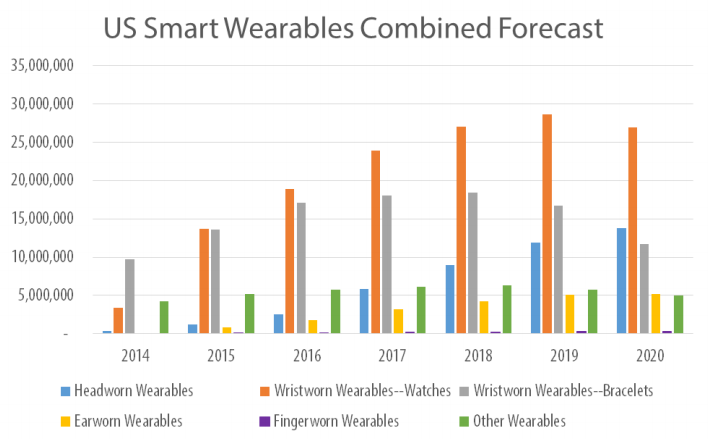 “The Slow Build: Smart Wearables Forecast, 2014-2020.” Technalysis Research. Note: This report does not include clothing with embedded sensors. Bob O’Donnell is skeptical of the ability of smart clothing to surpass other wearables in the foreseeable future. The Bureau of Labor Statistics tracks apparel expenditures as well as indexed prices (CPI – prices relative to a base year, not actual prices). Apparel includes a broad range of subcategories. Where available, we have also sought item-level data, using men’s Tshirts as an exemplar. Expenditure data is available going back to 1990. CPI data is available going back to 1947. Tshirt CPI data is available back to 1997 (possibly earlier – awaiting clarification from BLS). No forecasts found. The apparel and services category had one of the largest increases in 2014. Average expenditures per consumer unit in 2014 were $53,495, a 4.7percent increase from 2013 levels, the U.S. Bureau of Labor Statistics reported today. During the same period, the Consumer Price Index (CPIU) rose 1.6 percent(1). In 2013, spending decreased 0.7 percent. Average pretax income per consumer unit increased at about the same pace as expenditures, up 4.8 percent from 2013. Consumer units include families, single persons living alone or sharing a household with others but who are financially independent, or two or more persons living together who share expenses. Note: The “Apparel and Services” category includes apparel and footwear for adults, children, and babies (including sportswear, and uniforms), as well as material for making clothes, shoe repair, alterations, sewing patterns and notions, clothing rental, storage, dry cleaning and sent-out laundry, watches, jewelry, and repairs to watches and jewelry. US. 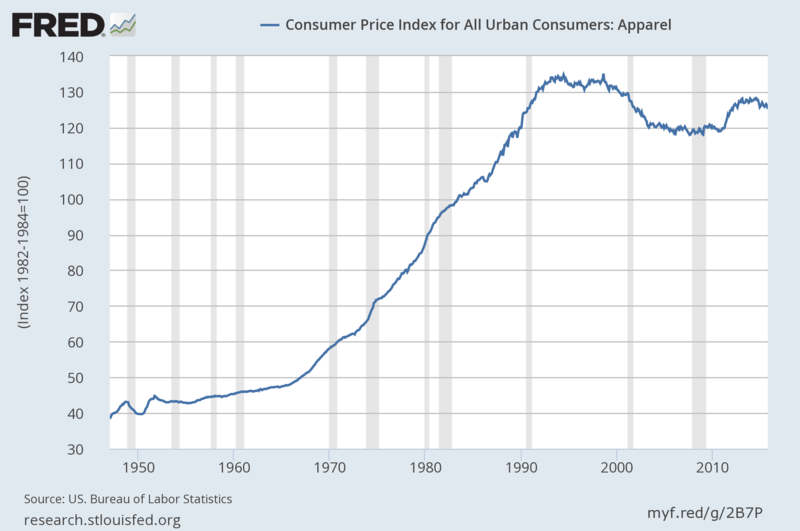 Bureau of Labor Statistics, “Consumer Price Index for All Urban Consumers: Apparel [CPIAPPSL].” Retrieved from FRED, Federal Reserve Bank of St. Louis, November 18, 2015. Note: Data available for download. “Consumer Price Index – All Urban Consumers.” Custom table, November 19, 2015. Bureau of Labor Statistics. Nicole Rope, of the BLS CPI Apparel division, warns that there is much more volatility in individual clothing items that in the category on the whole (and more so compared with other items in other categories). She offers to speak with us if we have any other questions about apparel. 202-691-5395. She also said that the Information and Analysis Section might also be helpful. Ken Stewart, manager, x6966. Steve Reed, senior economist x5378. They would be able to let us know if data older than 1997 is available. Shirt data was collected before that, but under a different name/definition. UPDATE: Steve Reed shared the following data by email. He said that price data (not index data) older than 1977 may be available on an inconsistent basis. He will followup with whatever he can find later in December or January. Samantha Sharf. July 2, 2013. “The TShirt Turns 100.” Forbes. Statistics on tattoo prevalence are quite thin, and I have not found a source for systematic, historic data. I’ve found no forecasts. Life, December 21, 1936. “One Out of Ten Americans is Tattooed.” P.30. Anne Laumann, Amy Derick. 2006. “Tattoos and body piercings in the United States: A national data set.” Journal of American Academy of Dermatology, 55(3). There are at least two professional organizations that publish plastic surgery statistics: American Society of Plastic Surgeons (ASPS), and The American Society for Aesthetic Plastic Surgery (ASAPS). Figures from the latter tend to be a bit lower than the former. Seeking clarification on the discrepancy. Procedures are typically broken down into two major categories: cosmetic and reconstructive. All readily available figures from ASPS are below (2005-2014). Awaiting to hear if pre-2005 figures are also available from ASPS.